The new 2018 E-PACE is here, and it’s primed to fill an important entry-level luxury niche within the brand's ever-growing model lineup. First off, it looks fabulous. Walking around my brand new 2018 E-PACE P250 AWD S tester, I couldn’t help but noticed how much longer and leaner it looks in the metal than it does in pictures. The front fenders are especially low-slung and obviously inspired by the beautiful F-Type sports car, while the same can be said of its slender LED taillights and diffuser-style rear bumper cap that comes fitted with sporty dual exhaust pipes at each corner. Inside, there’s even more F-Type design elements in use, the most noticeable being the centre stack and lower console combination with its leather-wrapped passenger grab handle and more traditional shift lever, rather than the rotating dial selector that wow’s newcomers to every other Jaguar model. I especially like the metal-edged rocker switch that juts up out of the console for selecting JaguarDrive modes, which once again is pulled right out the Jaguar sports car. We’re off to a good start and I haven’t even put my foot to the floor. The base P250 all-wheel drivetrain isn’t the most potent in the E-PACE lineup, but at 246 horsepower and 269 lb-ft of torque from only 1,200 rpm the 2.0-litre four-cylinder delivers considerable off-the-line jump and plenty more energy when revs climb. It felt best when the aforementioned driving mode toggle was set to its sportiest Dynamic setting before flipping the gear lever to the left “S” mode for manual actuation, this feature altering throttle response, transmission shift points, climate control efficiency and more, its other modes being Comfort, Eco, plus a Rain/Ice/Snow setting that would be ideal for clambering out of our local ski hill parking lots. The E-PACE’ shifter connects through to a ZF-sourced nine-speed automatic transmission that would be a class-exclusive if it weren’t for the Range Rover Evoque, an SUV this E-PACE shares much of its underpinnings with. That Evoque gets renewed with the same in-house JLR Ingenium engine lineup this year, while both SUVs can be upgraded with more potent versions of the same engine making 296 horsepower and 295 lb-ft of torque, Jaguar version dubbed E-PACE R-Dynamic P300 AWD. Fuel economy is competitive too, with the P250 AWD rated at 11.0 L/100km city, 8.4 highway and 9.8 combined and the P300 AWD good for a claimed 11.2, 8.6 and 10.1 respectively. My just-above-base P250 AWD S tester was more than just a good time in a straight line, it also provided the type of high-level agility expected in a modern-day Jaguar. Looking back, the F-Pace commanded respect right out of the box, and while I wouldn’t go so far as to say this high-strength steel-intensive subcompact outpaces its larger aluminum-skinned sibling, it’s easily one of the best at managing corners in its segment. Underfoot were upgraded 19-inch alloys on Pirelli Scorpion 235/55s, an obvious advantage even in the wet, slippery, water and slush covered streets that wound their way through Vancouver after an unexpected snowfall, allowing the little ute to grip tarmac with a little more tenacity than its base 17s would’ve otherwise provided. While wonderfully capable through fast-paced S-curves and thoroughly stable at freeway speeds, its ride was never choppy despite its shorter wheelbase, and while bordering on firm I think most should find it plenty pleasant. More importantly the E-PACE felt solid and well-made, much more so than a number of others in this class. Along with an extremely tight turning circle that made it easy to park, I also found the E-PACE’ ride height a little taller than most segment rivals, which aided visibility all around. Its rear windows are narrower than some, this providing the sharp profile that makes it so attractive, but rearward vision was never hampered while the view out the passengers’ side is excellent. On that note the driver’s seating position is also superb and overall ergonomics as good as this class gets. I was able to set up my seat perfectly, and could also extend the telescopic steering wheel to the point that it was ideally positioned for optimal control, enhancing both performance and safety. This is one aspect of Jaguar ownership I appreciate more than with some other brands that don’t always fit my body type. Additionally, the E-PACE seat squabs extend more comfortably under the legs, while the backrest is carved out nicely for the lower torso. When the driver’s seat was set up for my five-foot-eight frame I still had about five inches of open air ahead of my knees when seated in back, plus plenty of space to move my feet around when wearing winter boots, while there was room to move from side-to-side too thanks to five or so inches next to my outside shoulder, about four inches next to my hips, and more than four inches above my head. Yes, the E-PACE is truly sizeable for a subcompact SUV, meaning someone substantially taller should fit in back comfortably, making this a suitable conveyance for a small family with large teens, or a couple that regular transports adults in back. The cargo area is generously proportioned as well, measuring 577 litres under the nicely finished hard shell cover behind its rear seatbacks, which makes it two litres more accommodating than the Evoque and (for reference) 349 litres less so than the Discovery Sport. The E-PACE has 685 litres of cargo space when including the area above the cargo cover, while if you fold its 60/40-split rear seatbacks down it can manage up to 1,487 litres of gear, which once again is exactly two litres more than the Evoque albeit 407 litres less than the Disco Sport. In other words, the E-PACE fits squarely within the subcompact luxury SUV camp. The rear seats fold easily via buttons on the seat tops, and the cargo compartment is nicely finished with high-quality carpeting up the sidewalls and rear seatback, four chromed tie-down hooks at each corner, plus webbed netting and an elastic holder on the passenger’s sidewall. As we should expect from a Jaguar the passenger compartment is nicely finished too, with a high-grade soft synthetic dash top that extends all the way down the side of the centre stack before wrapping around the lower console and shifter too. The front and rear door uppers are made from premium-padded composite as well, while hovering above are fabric-wrapped A-pillars. Overall, E-PACE fit and finish is excellent as well, and the quality of materials is on par with or above the class average. This is especially true of switchgear, which is extremely tight fitting and nicely damped. I’d point to the three metal-rimmed, colour display-topped dials that make up the dual-zone auto climate control interface as personal favourites, as they incorporate a seamless minimalism that’s appealing even for the E-PACE’s premium sector, while metal-trimmed window switches and other niceties make it clear this little SUV represents Jaguar well. Those features are standard in all E-PACE trims incidentally, as are auto on/off LED headlamps, branded metal treadplates, pushbutton ignition, an electromechanical parking brake, heated power-adjustable side mirrors, an attractive and fully featured colour multi-information display within the gauge cluster, rain-sensing wipers, the segment’s largest 10-inch TouchPro touchscreen infotainment display with tablet-style swipe, pinch and zoom gestures, voice activation, a rearview camera, six-speaker 125-watt audio, front and rear parking sensors, plus more for just $42,700. The base E-PACE includes all the expected passive and active safety equipment too, as well as and plenty of advanced driver assistance systems like semiautonomous low-speed cruise control that automatically adjusts engine and brake settings to help drivers maintain control on slippery surfaces, autonomous emergency braking from 5 km/h to 80 km/h for frontal collisions and 5 km/h to 60 km/h for pedestrians, lane keeping assist, All Surface Progress Control, Hill Launch Assist, a Driver Condition Monitor that sounds an alert if the driver is getting drowsy, and more. My tester was in second-rung S trim, which meant that for $45,200 it comes with one-inch larger nine-spoke 18-inch alloys, signature LED daytime running lights, auto-dimming, power folding, heated side mirrors with approach lights, an auto-dimming rearview mirror, 10-way power-adjustable front seats, leather upholstery, a rear centre armrest, upgraded Navigation Pro infotainment, Smartphone and Connect Pro packages, plus more. On top of this, Jaguar added the aforementioned 19-inch alloys for $1,120, Santorini black metallic paint for $670, heated front seats for $510, an $820 Cold Climate package with a heatable steering wheel, a heated windscreen, heated windshield washer jets, and a higher grade soft grain leather steering wheel, a head-up display for $1,020, an Ebony Morzine (black) headliner for $410, three rear power sockets for $230, a powered liftgate for $360, and Configurable Dynamics for $360, bringing the total up to $50,860 before freight and fees. While I was happy the way it was outfitted, if this were my personal ride I’d be more than tempted to go with a sportier looking set of 19-, 20- or 21-inch rims that range in price from the same $1,120 as my upgraded wheels to $3,670 for the largest on offer, while the $1,180 panoramic sunroof would be a must-have add-on. Audio quality is important to me too, and while the base stereo was fine I’d upgrade to either the $410 380-watt 11-speaker Meridian system or the $1,230 825-watt 15-speaker surround sound alternative, while the $570 fully configurable digital gauge cluster would be a good choice too. That said adding auto high beams for only $260 is a no-brainer, as are any number of other options available with this S trim, or you may want to consider moving up to the SE package or for that matter R-Dynamic or First Edition trims. If you want more info I cover all available trims, packages, options, prices and more in a separate E-PACE news story you can check out in the News & Events section of this website. Suffice to say that Jaguar has put a lot of time and effort into making sure its new E-PACE targets the wants and needs of today’s compact luxury SUV buyer, which will no doubt help it achieve similar success to its bigger F-Pace brother. 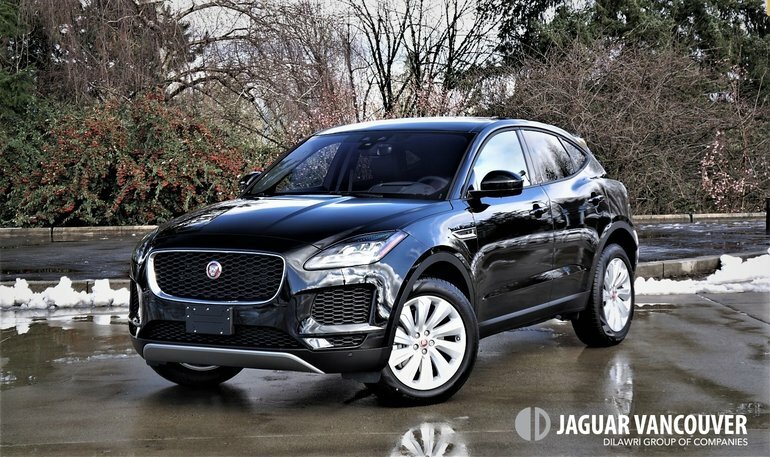 So make sure to check out the new 2018 Jaguar E-PACE. It’s impressively finished, very well equipped for the money, loads of fun to drive, and great looking. It should definitely be on your shortlist.